Where do you find silence? There with the delicate fern. And there with the brilliant tall grass...and in wordless Wednesday. Thank you for this! Thanks for sharing! Very nice entry. Such sweet serenity you captured in these photos. WW #23 How Many Leaders Does It Take? Beautiful - so peaceful. I find silence at home in the Black Hills...and on road trips. There's always such a delicacy to your photos, and I just love it! Wonderful photos - love the tall grass. Silence? Almost nowhere with two small kids & a rambunctious husband. Oh, watering the garden - that's the best silence, fresh air & morning sun. Good contrast of both shots. I liked them both. Thanks for stopping by! The part of Linville Falls I was shooting is a little off the beaten path (though not much) and that series was taken several years ago (2001). 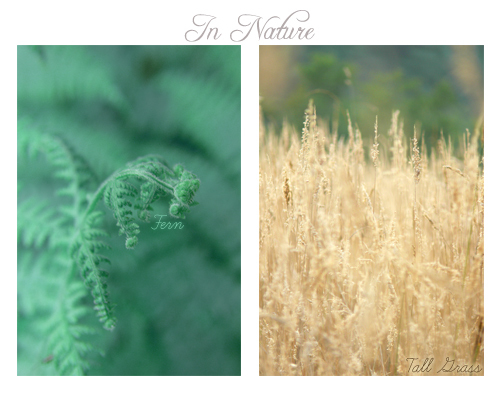 I love the (almost) monochromatic feeling in both of these shots -- especially the fern. It adds a richness to the image. Beautiful shots both of them. Your pictures are like meditation. Laying on moss in a cool forest, picking blueberries in the tundra, sitting on flat smooth rock by clear water, rain on a tent roof. Maybe these are places of peace more than places of silence. I find silence in lost of things like sitting out on my deck with cuppa tea on an early summer’s morning or gazing into a starry night sky. I find silence when I stop and realise the beauty in every day things that I have taken for granted. Stopping to appreciate them in a busy life brings a little bit of peace. Love the softness of this and your gentle words. Beautiful. Thanks for sharing at Shutter Sisters.